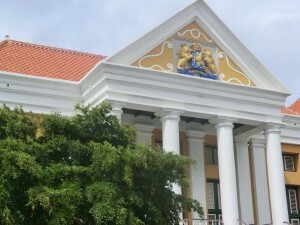 WILLEMSTAD - The Public Prosecution (OM) is investigating an incident which took place in the court recently where the legal representative of the murder suspect D’Angelo, accused of killing Helmin Wiels and Raul Bolle Martinez, gave certain reporters copies of an official report related to her client. During the case treatment, the lawyer, Mrs. Gladys Sophia-Alendy, gave the official report to the media while these were only intended for the judge, the prosecution and the lawyer. The OM confirms that what was published in the media is information contained solely in the official report and which was not handled during the case treatment. The OM is contemplating if they will file a complaint against this lawyer at the disciplinary tribunal so they can decide whether this lawyer has acted against the rules. The OM considers that the lawyer has leaked information, because she has made copies of these official reports and gave them to the media.